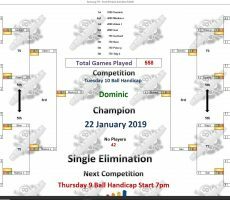 TUESDAY 10 BALL – 22nd JANUARY : DOMINIC WINS. 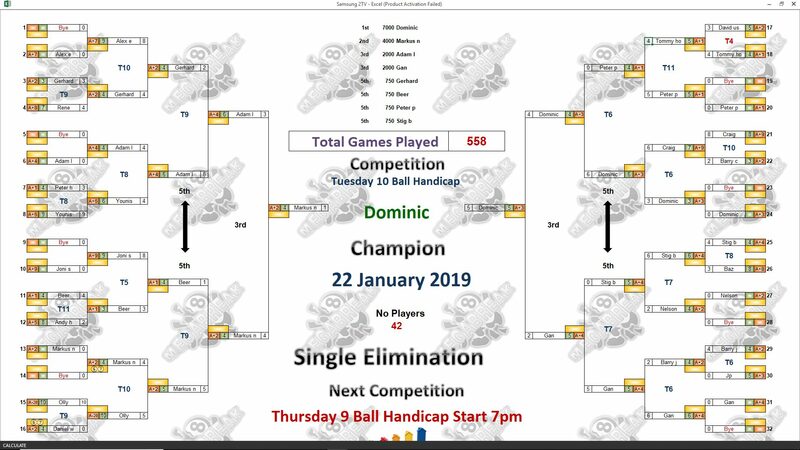 Israel’s Dominic Zagouri is our 10 Ball Champion for this week. 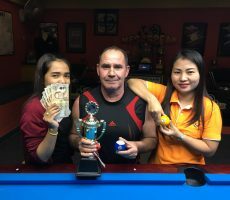 From the highest entry number for 10 Ball in more than two years at a massive 42 players, he comfortably beat Germany’s Markus Nolberczak in the final by 4 racks to 0 (race 4-3) to claim the 1st Prize of 7000 baht. 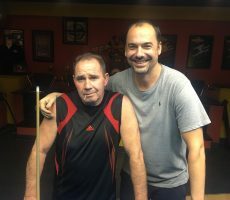 He was on top form all night long to win six matches without defeat, with only one of his opponents reaching the hill against him, such was his dominance. 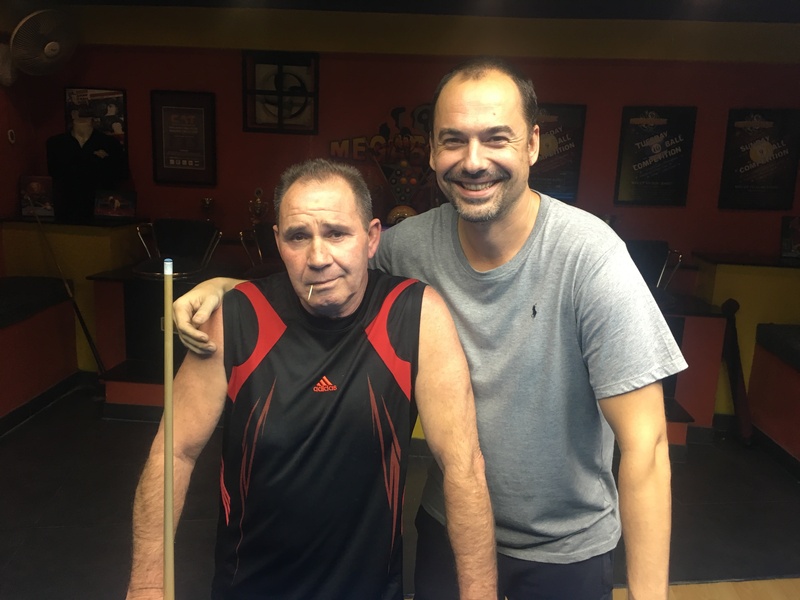 Markus did well to reach the final undefeated, but then had no answer to our winner, and took home 4000 baht as Runner-Up. 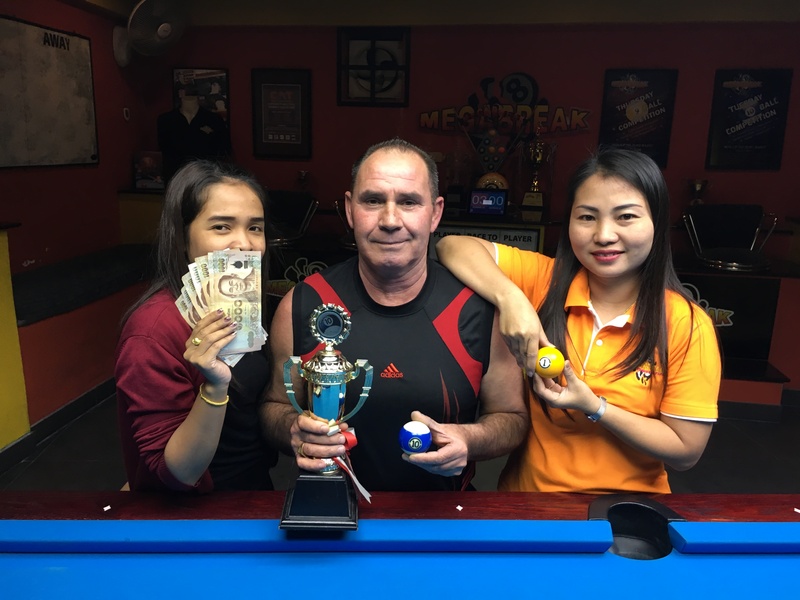 Good performances from Aussie Adam Lux and Megabreak staff member Gan Kanchana Chinboot saw them pocket 2000 baht each for reaching the semi-finals. 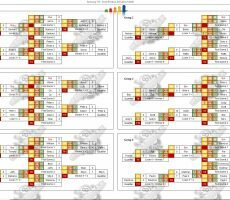 Gan’s handicap is now increased to A+5 for the first time as a a result. Champion : Dominic (A+3) – 7000 baht. 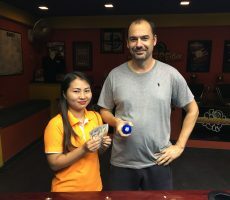 Runner-Up : Markus (A+2) – 4000 baht. 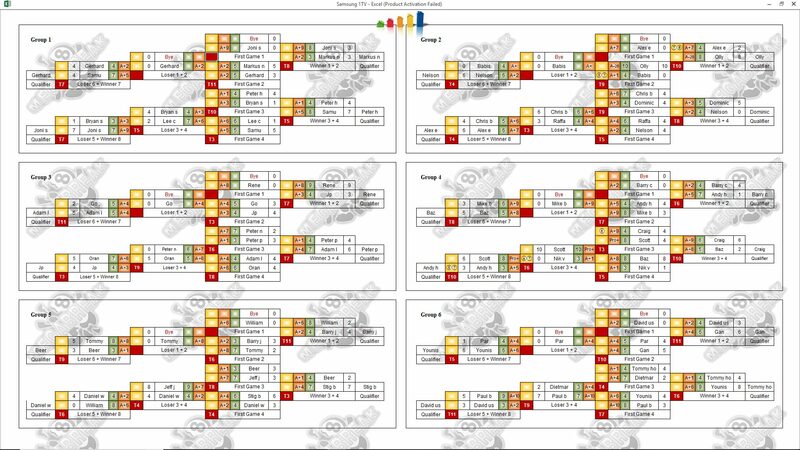 Semi-finals : Gan (A+4) and Adam (A+4) – 2000 baht each. Quarter-finals : Stig Berntsen (A+4), Gerhard Schebler (A+2), Peter Pellack (A+1) and Beer (A+1) – 750 baht each. The Player Auction Prize Pot totalled 53500 baht and was won by Peter Jiskoot from The Netherlands. 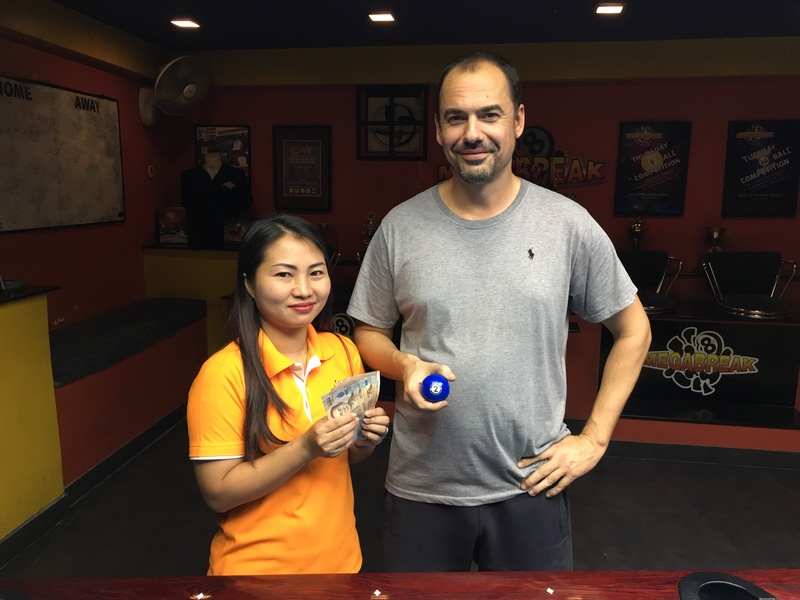 He bought Dominic for just 900 baht, and they shared the 1st Payout of 15k. 1st : Peter (Dominic) – 15000 baht. 2nd : Babis Lappas (Markus) – 11000 baht. 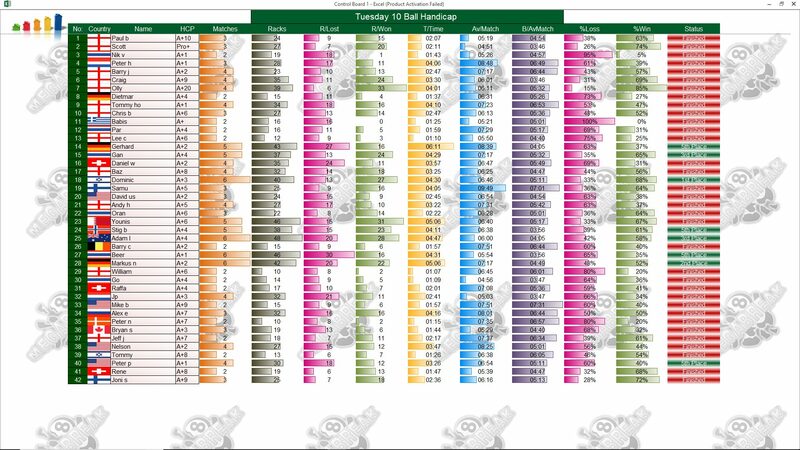 Equal 3rd : Andy Hall (Gan and Adam) – 6400 baht twice. Equal 5th : Andy (Stig and Beer), Olly (Gerhard) and Tommy (Peter) – 3000 baht each.